Thank heavens for the smoothie. When one of my teenage daughters oversleeps and has “no time” for breakfast, I can throw in the blender an assortment of fruits, vegetables and things that don’t normally go with fruits and vegetables (like hemp seeds or almond butter) and we’ve got a balanced meal in seconds. The smoothie is something even a 10-year-old like Mr. Picky can make by himself, and he does almost daily. His favorite is a combination of frozen banana, strawberry, pineapple, yogurt, coconut water, coconut butter and a squirt of Barleans Mango Omega Swirl. He even makes smoothies for his friends when they come over. So cute. I love making smoothies at home, because I can control what goes into them, especially the sweetener. I rarely order smoothies in restaurants because I find them to be too sweet. And I’m not falling for what Jamba Juice considers a smoothie. Anything blended with frozen yogurt or sherbet is basically a fruity milkshake and it is not breakfast material. I saw this recipe on Joy the Baker a while back and it made me think of flavored waters which I like to have on hand in the summer. 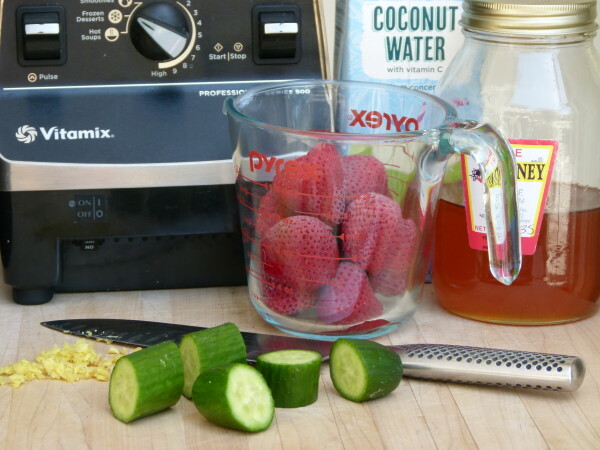 (Just take a pitcher of water and toss in some cucumber slices or strawberries or watermelon or even pineapple rinds. Mint is fun to add in, too.) I loved this smoothie instantly. It felt like something I would have at a spa, and I sure don’t go to spas often enough! There isn’t an overwhelming flavor of cucumber, it’s so subtle. 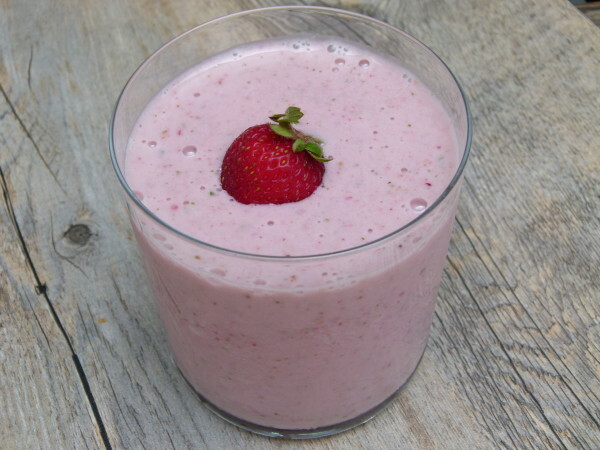 The smoothie feels lightly sweet and super refreshing. I prepare this several different ways. Almond milk makes it creamy, and coconut water keeps it light and fresh, more like spa water. I don’t usually add extra sweetener to mine, but the kids like it a tad sweeter. Honey or even pitted dates work beautifully. And if I have fresh ginger on hand, I love to add a little for an extra special kick. Ginger is incredibly anti-inflammatory and so great for digestion. Cucumber is one of the most alkalizing foods and terrific for the skin. And strawberries are rich in Vitamin C and other powerful phytonutrients. Total beauty smoothie here! The only missing from this smoothie is protein, so I wouldn’t consider this a meal. But if you did want to include protein, I would throw in protein powder (keep in mind most are sweetened), hemp or chia seeds, or use yogurt instead of the almond milk. Yogurt is more tart than almond milk, so you might need to add a little sweetener to balance it out. 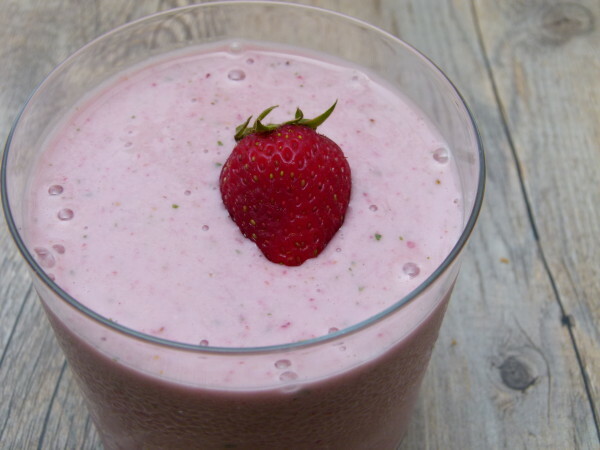 If you’re tired of your same-old-same-old smoothie, give this one a try and get glowing! Add more almond milk as necessary, depending on your desired consistency. Note: you can substitute frozen blueberries or blackberries and add ground flax meal, hemp seeds or protein powder. So yummy! Kids also loved it with raspberries and pineapple substituted for the strawberries (and honey)!! I promise that you can’t taste the spinach even though I put a good bit in mine. Oooh, sounds perfect. I love spinach in smoothies!